EnglishCentral’s library of 10,000 interactive videos lessons for English learning is now available on Moodle. Moodle is an open source, learning platform with over 68 million users and 55,000 sites deployed worldwide. The EnglishCentral Module is FREE for use in schools for up to 50 Students. With our new Moodle module, teachers can now give students access to EnglishCentral’s unique video library, vocabulary learning and speaking technology, without giving up the security and convenience of Moodle’s LMS for storing student information and student progress. The entire database of EnglishCentral videos can be accessed from within Moodle through a Search Feature. Teachers can search for and select videos based on topic, learning objective, video length, or level. There are 7 levels of videos on EnglishCentral, ranging from CEFR A1 to C2. WATCH. Students watch videos with transcripts and a bilingual dictionary, clicking on any word in the video they don’t know or would like to study. SPEAK. Then, using EnglishCentral’s IntelliSpeech assessment technology, students speak the words in the context of sentence, getting instant feedback on their pronunciation and fluency. Students can track the number of videos watches, vocabulary learned, and line spoken for each activity. Their progress is updated in real-time. Teacher can track Student progress against the set goals via the Moodle Gradebook Students overall completion % for each Moodle activity is shown in the Moodle Gradebook. For use with up to 50 students in an institution, the EnglishCentral Moodle Module is FREE in 2018. For deployments bigger than 50 students, please contact us. Generally we price EnglishCentral per student per semester at cost less than a traditional textbook. 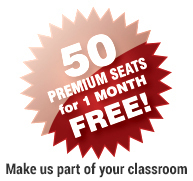 This gives teachers and students access to all 10,000 video lessons and over 50 EnglishCentral courses, at a price less than a traditional textbook. The EnglishCentral Module is using responsive designs and therefore can be used on supported mobile devices, which include Android 5.0 and later, and IOS 11 and later. Please click here for steps on how to integrate EnglishCentral in your Moodle platform. This EnglishCentral Module for Moodle was developed with Prof. Gordon Bateson from Kochi University of Technology in Japan. Gordon is currently using this with his students in a Presentation Course and has also created a demo course for Science English, each deployed using the new EnglishCentral Module for Moodle. Demos of these courses are available upon request. Please fill out the form below to schedule a demo.